It finally feels like Spring in Chicago this past weekend! I take a long solitary walk around the neighborhood for the first time without my winter jacket. Everywhere I past, I see flowers blooming. And that barren trees in front of my apartment? They turn out to be cherry blossom trees! Everything has finally come alive after the interminable winter. 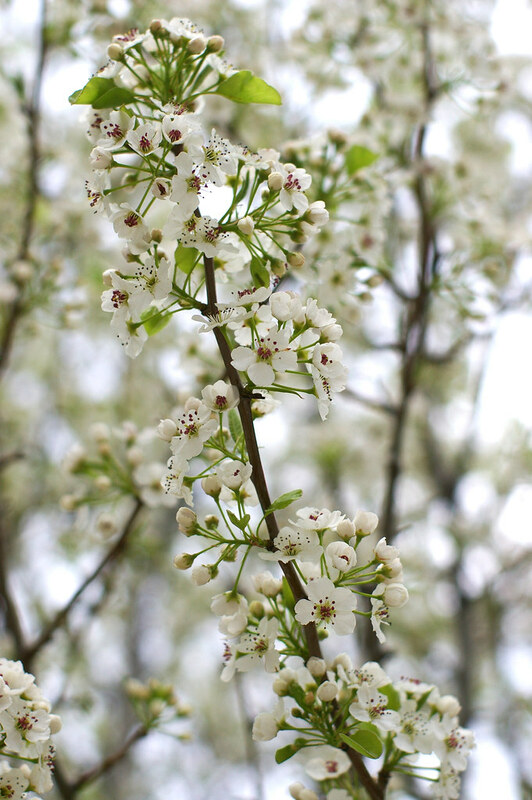 I couldn't help smiling when I look up and being greeted by the dense and snowy white blossoms. The gorgeous weather beckons pictures to be taken outdoor. 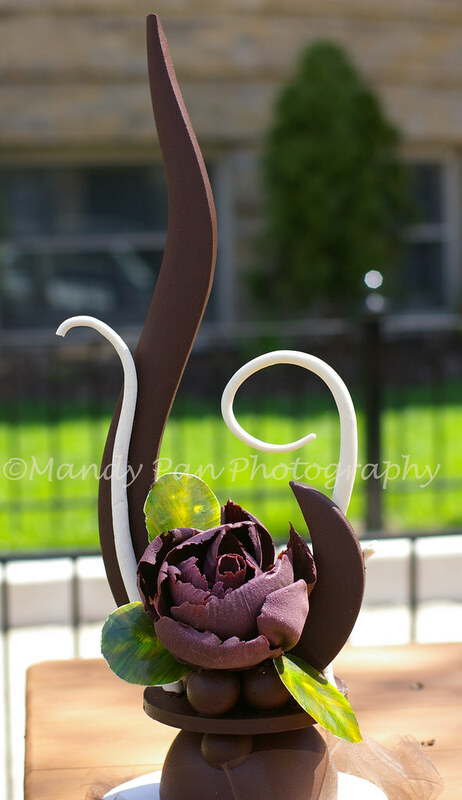 So I carry my chocolate showpiece out and start snapping away. Perhaps the noon heat is a little too much for the chocolate. After a couple of shots, my rose shows sign of melting. Time to bring it indoor! As you can see, I am not much of an artist. It took me two attempts to come up with something that vaguely resembles a rose. My leaves are horrible and the white curly looking things? Mine just didn't make the cut. In the end, my friends come to my rescue and pass me their remaining curls so I can finish my showpiece. I would like to think of this chocolate showpiece as a collaborative effort. It warms my heart that my artistic friends come over to help when crisis strikes. They attach the right pieces in the right places when I couldn't make up my mind. Not only that, they stop me in the track when I am ready to attach one too many leaves on the showpiece. That's what true friends do. They tell you the truth, not afraid of hurting your feeling, while having your best interest in mind. And they come through when you need a hand. Too many times I see "friends" back stabbing each others when the other is not looking. I felt particularly bad during the last exam when someone let her friend's products turned brown to the point of burning in the oven without saying a word. I felt so bad that I went to tell that "friend" to check on her products. Even an acquintance would do that. But she would rather let her friend's products fail, so hers may look better. What kind of friends do that?! Mandy, I'm sure now you know this the the real world- almost everywhere! Met too, hated it when someone just quietly back-stabs each other. Anyway, I admire your courage and hardwork in the USA! Keep it up girl! I DO admire your work! i thought tt was one of those red cabbages. looks so real,great job mandy! it's been scorching HOT here, n i envy ur weather. n the flowers! What a beautiful and stunning show piece! Beautiful details! Beautiful! The leaves are fantastic! What a gorgeous centerpiece! I've always been told the way to have a friend is to be a friend. It sounds like you're surrounded by the loving, caring friends you deserve. BEAUTIFUL!! You all did an awesome job. You're lucky to have such good friends. I wish I were as lucky. wow, that is positively incredible! Very pretty! That makes me happy that you have colleagues who will help you out. Most of the people on my classes are like that, looking out for each other. It seems so shortsighted not to help each other out, who knows when they will forget things burning in the oven? The world is so much of a nicer place when we all think of each other. Nice work! It's great really! It saddens me that people wouldn't look out for each other... good friends are valuable! OMG, what a work of art! Yes,it's good to know who your real friends are! How beautiful! Chicago in the spring is the absolute best. I love that city! The camaraderie and harmony shows in the showpiece-- it's so beautiful! I'm glad it didn't melt in a minute with the sun shining so brightly! Don't be hard on yourself! I actually love your rose! It's a gorgeous chocolate piece, well done girl! Your rose is definitely charming to me ! It's so beautiful...nice work...you are so lucky to have such great friends. 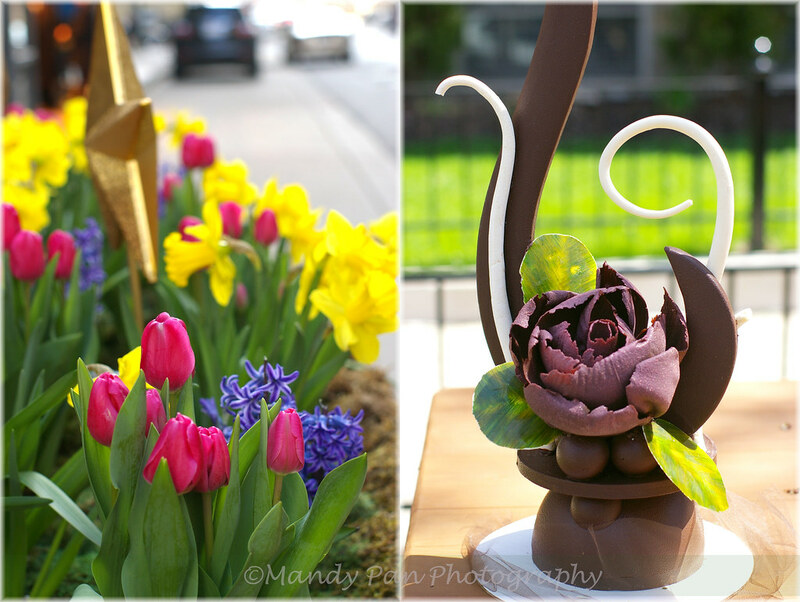 No backstabbing; just delicious chocolate and beautiful Spring weather. This showpiece looks incredible. I could never make something this beautiful. You are very, very talented. 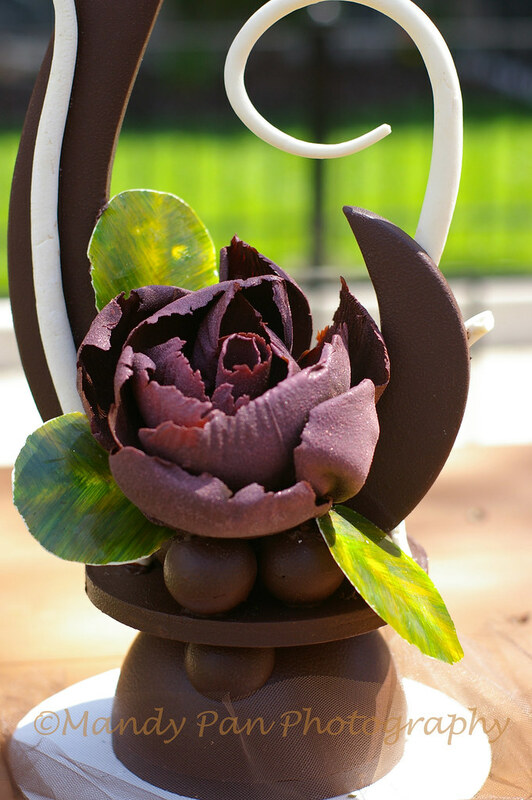 Btw your chocolate showpiece is FANTASTIC! You're really really artistic. I enjoy reading your blog, pictures taken are great and beautiful!